Please refer to our stock # J1270 when inquiring. Offered is an interesting and varied, quality sextet of Patent Medicines as follows! First is a Munyon's Headache Cure which has a screw cap glass vial in a colorful box. This medicine sports a partial tax stamp, measures 2.75 inches and is in fine condition. The two Dr. Franklin's Specific Cures measure just over 3 inches long and sport very graphic and appealing labels. The first glass vial marked #24, cures Diseases of the Ear and Hearing and more. The second glass vial marked #31, cures Sore Mouth and Canker, plus Morning Sickness, Syphilitic Sore mouth and more. The condition of both vials is very good. Next, is a very colorful REQUA'S CUBEB CIGARETTES box of 12--complete! This Brooklyn, N.Y., medicine claims to relieve minor sore throat and bronchial irritations including nasal congestion due to colds. Please note the image of the patient puffing casually on a cigarette to retain good health!!!! The box is in good condition with wrinkling and creases and is 3.25 inch high. MOTHERSILL'S TRAVEL REMEDY is a cute box of 12 capsules for children. This 2 inch cutie is empty, in very nice condition and is made in N.Y. 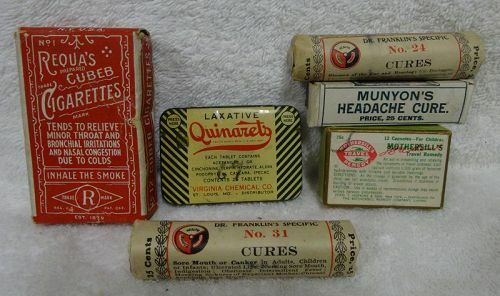 Item #6 is a laxative tin, QUINARETS, from the Virginia Chemical Company with partial contents, pamphlet and is in good condition. The tin measures 2.5 inches with some mild scratches and wear. Together a wonderful grouping of quite interesting patent medicines from the early 1900s to 1940s.